Leotheras the Blind brought out the best and the worst in us. I suspect this fight gave a few of our healers and prot warriors nightmares. Even now he is farmable, I think there are some raiders that say a little prayer everytime demons come out, that their number isn't up. We spent 2 nights on the fight. It took us some time to get the hang of the aggro resets, and the inner demons. We went away to sleep on it, and pull out the Ouija board to ask for answers. As is usual, we came up with some unconventional strat tweaks that worked for us. Once our healers, prot warriors, and strangely...hunters, were able to kill their inner demons consistantly, it was only a matter of time till Leo succumbed to us. The fight really only starts when Leo has 15% life. Everything prior to that is just to check that your raiders aren't having brain afk. The next step is to try to control the complete chaos that is post 15%. We failed the controlling part but managed to turn complete chaos into a chaotic downing.....reminiscent of our first Onyxia downing. We hit 15% with 24 people up. We pushed through his speech and took him to 11%. "Fine, good work....now stop dps." We did. He whirlwinded and the tanks picked him up cleanly. "Now gogogo." We blew trinkets and Heroism and nuked hard. He whirlwinded again. The tanks picked him up again...but this time a lot of people had WW dots. Dps continued. My deathcounter started to tick over. Healers frantically spammed heals on any dps, and also the demon tank- me. At this point i became unhealable and died. 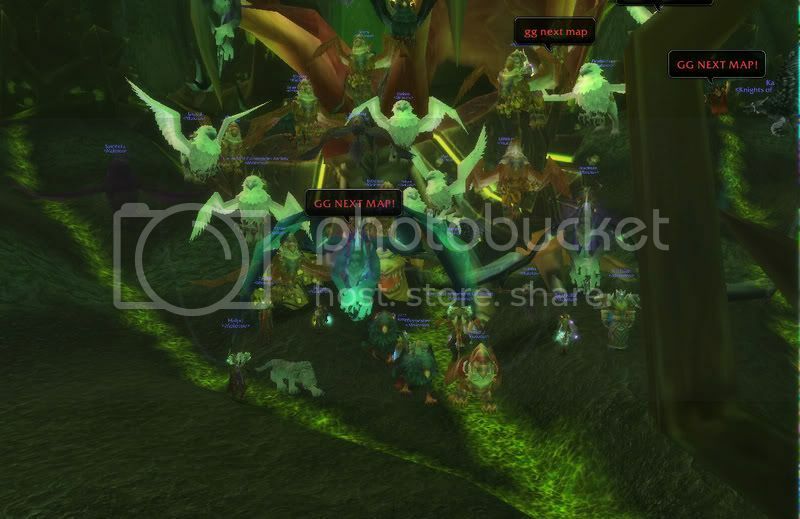 Race was on now with 2 mobs doing huge amounts of damage to the raid. Leo was emoting "Who's the master now? ", over and over as another dps class was slain. He ticked over to 2%. "More dots. More dots FFS!!" He ticked over to 1%. At this point we had 2 tanks, 6 healers and an elemental shaman left. There was a huge release on vent. We earned this one. Personally i enjoy this fight. I never get to meet my inner demon because I'm primary focus in demon phase. I have an incredibly simple job(spam button '6'....im really good at it hey). I also get a prime armchair view of our prot warriors and heal spec'd priests struggling with their inner demons which gives me personal amusement. In the spirit of the "Where's Wally?" 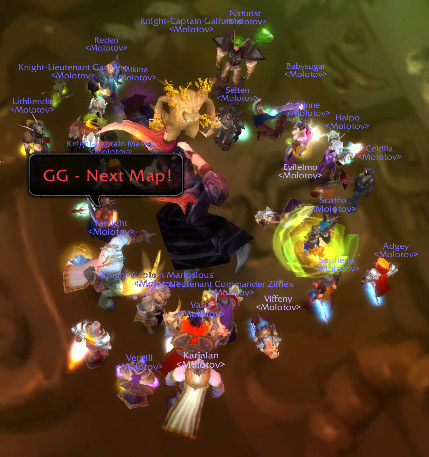 books, i name this picture "Where's Kazzak?" Yes, it took me a while to post this update. It's extremely demoralising to be 5 minutes from finishing a post, and get blue screened. Now buff your stam and bring some Arcane resist for Solarian, 4 bosses left till Hyjal. Last edited by Sapherix on 11 Jul 2007, 00:39, edited 1 time in total.